This book has been cited by the following publications. This list is generated based on data provided by CrossRef. White, Dave D. Lawless, Krista L. Vivoni, Enrique R. Mascaro, Giuseppe Pahle, Robert Kumar, Ipsita Coli, Pedro Castillo, Raúl Muñoz Moreda, Fekadu and Asfora, Marcelo 2018. Co-Producing Interdisciplinary Knowledge and Action for Sustainable Water Governance: Lessons from the Development of a Water Resources Decision Support System in Pernambuco, Brazil. Global Challenges, p. 1800012. Kristjánsdóttir, Kristín Rut Ólafsdóttir, Rannveig and Ragnarsdóttir, Kristín Vala 2018. Reviewing integrated sustainability indicators for tourism. Journal of Sustainable Tourism, Vol. 26, Issue. 4, p. 583. Hugé, Jean Mukherjee, Nibedita and Sutherland, William 2018. The nominal group technique in ecology & conservation: Application and challenges. Methods in Ecology and Evolution, Vol. 9, Issue. 1, p. 33. Russ, Meir 2018. Handbook of Knowledge Management for Sustainable Water Systems. p. 1. Kishita, Yusuke Uwasu, Michinori Hara, Keishiro Kuroda, Masashi Takeda, Hiroyuki Umeda, Yasushi and Shimoda, Yoshiyuki 2018. Toward designing sustainability education programs: a survey of master’s programs through semi-structured interviews. Sustainability Science, Vol. 13, Issue. 4, p. 953. Sword-Daniels, Victoria Eriksen, Christine Hudson-Doyle, Emma E. Alaniz, Ryan Adler, Carolina Schenk, Todd and Vallance, Suzanne 2018. Embodied uncertainty: living with complexity and natural hazards. Journal of Risk Research, Vol. 21, Issue. 3, p. 290. Suldovsky, Brianne McGreavy, Bridie and Lindenfeld, Laura 2018. Evaluating Epistemic Commitments and Science Communication Practice in Transdisciplinary Research. Science Communication, Vol. 40, Issue. 4, p. 499. Talukder, Byomkesh Hipel, Keith W. and vanLoon, Gary W. 2018. Using multi-criteria decision analysis for assessing sustainability of agricultural systems. Sustainable Development, Vol. 26, Issue. 6, p. 781. Avelino, Flor 2017. Power in Sustainability Transitions: Analysing power and (dis)empowerment in transformative change towards sustainability. Environmental Policy and Governance, Vol. 27, Issue. 6, p. 505. Hugé, Jean 2017. Participatory sustainability assessment for spatial planning: reflections from a pilot exercise in Flanders, Belgium. Impact Assessment and Project Appraisal, Vol. 35, Issue. 4, p. 284. Sharma, Somesh and Geerlings, Harry 2017. Smart and Sustainable Planning for Cities and Regions. p. 185. Raus, Rea 2017. Student Teacher Ecological Self in the Context of Education for Sustainable Development: A Longitudinal Case Study. Journal of Education for Sustainable Development, Vol. 11, Issue. 2, p. 123. Annema, Jan Anne Frenken, Koen Koopmans, Carl and Kroesen, Maarten 2017. Relating cost-benefit analysis results with transport project decisions in the Netherlands. Letters in Spatial and Resource Sciences, Vol. 10, Issue. 1, p. 109. Sharma, Somesh and Geerlings, Harry 2017. Urban Governance in the Realm of Complexity. p. 283. Vaugeois, Nicole Schroeder, Joanne and Harnett, Michelle 2017. The role of leisure in integrated community sustainability plans within Canada. Leisure/Loisir, Vol. 41, Issue. 3, p. 343. Brick, Kerri Visser, Martine and Van der Hoven, Zoe 2016. Cooperation and Climate Change: Can Communication Facilitate the Provision of Public Goods in Heterogeneous Settings?. Environmental and Resource Economics, Vol. 64, Issue. 3, p. 421. Abdul-Rahman, Hamzah Wang, Chen Wood, Lincoln C. and Ebrahimi, Makdokht 2016. Integrating and ranking sustainability criteria for housing. Proceedings of the Institution of Civil Engineers - Engineering Sustainability, Vol. 169, Issue. 1, p. 3. Thomas, Fabian and Knüppe, Kathrin 2016. From Flood Protection to Flood Risk Management: Insights from the Rhine River in North Rhine-Westphalia, Germany. Water Resources Management, Vol. 30, Issue. 8, p. 2785. Burns, Tom R 2016. Sustainable development: Agents, systems and the environment. Current Sociology, Vol. 64, Issue. 6, p. 875. Edited by Bernd Kasemir, Harvard University, Massachusetts , Jill Jäger, International Human Dimensions Programme, Bonn , Carlo C. Jaeger, Potsdam Institute for Climate Impact Research , Matthew T. Gardner, Biogen Inc.
Email your librarian or administrator to recommend adding this book to your organisation's collection. 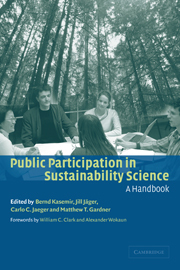 This book discusses how citizens can participate more effectively in sustainability science and environmental policy debates. It discusses designs for participatory procedures, and experiences of their application to issues of global change. While the focus is on citizen participation, the involvement of specific stakeholders - including water managers and venture capitalists - is also addressed. The book describes how focus group methods were combined with the interactive use of computer models into new forms of participation, tested with six hundred citizens. The results are discussed in relation to other important topics, including greenhouse gas and water management. By combining this with an examination of issues of interactive governance and developing country participation, the book provides state-of-the-art, practical insights for students, researchers and policy makers alike. Full text views reflects the number of PDF downloads, PDFs sent to Google Drive, Dropbox and Kindle and HTML full text views for chapters in this book. Book summary views reflect the number of visits to the book and chapter landing pages. * Views captured on Cambridge Core between #date#. This data will be updated every 24 hours.